Every once in a while I stumble over some crazy article in the newspaper that reports about someone rich building a doomsday shelter or bunker to keep safe from whatever might strike earth in the near future. With the Zombie Apocalypse looming on the horizon (see 28 Days Later, Resident Evil, Dawn of the Dead, I Am Legend, The Walking Dead), it's only natural that we would want to be as prepared as possible. 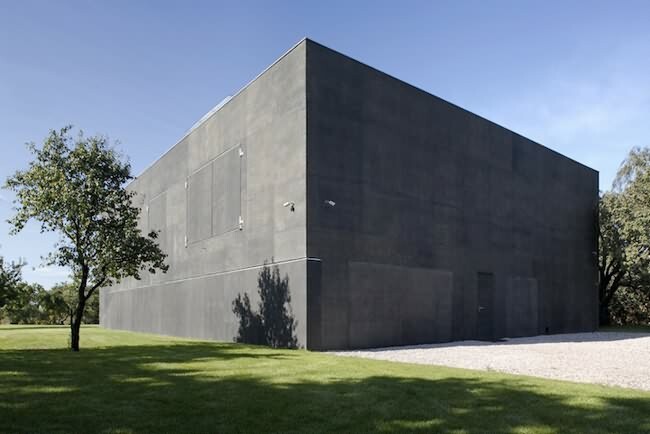 Nestled along the outskirts of Warsaw, Poland, this KWK Promes designed Safehouse is well on its way to being Zombie Apocalypse approved while still being more than worthy of gracing the covers of various modern architectural magazines. The only way to get in or out of this fortress is really through the drawbridge that swings down over the pool area outside. 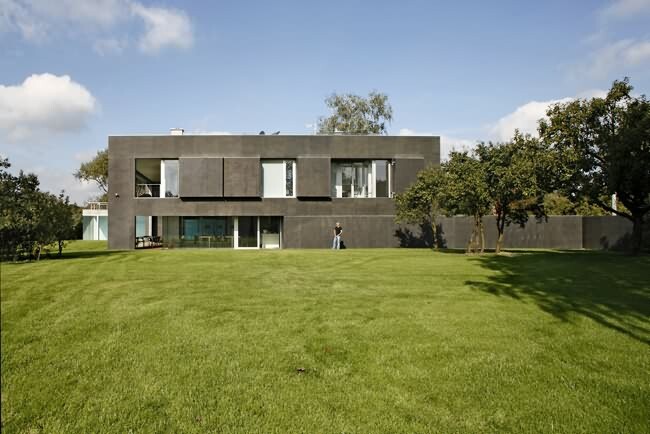 So if you truly want to make sure there are no zombies munching on your brains during the night, then I suggest you give the bright minds over at KWK Promes a call and hook yourself up with one of these houses pronto. 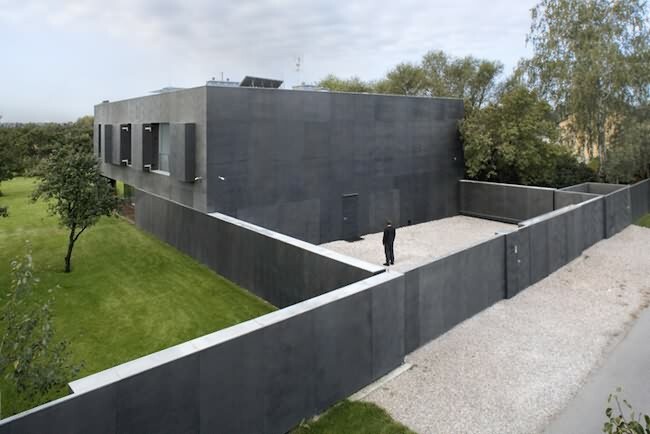 The clients' top priority was to gain the feeling of maximum security in their future house, which determined the building's outlook and performance. 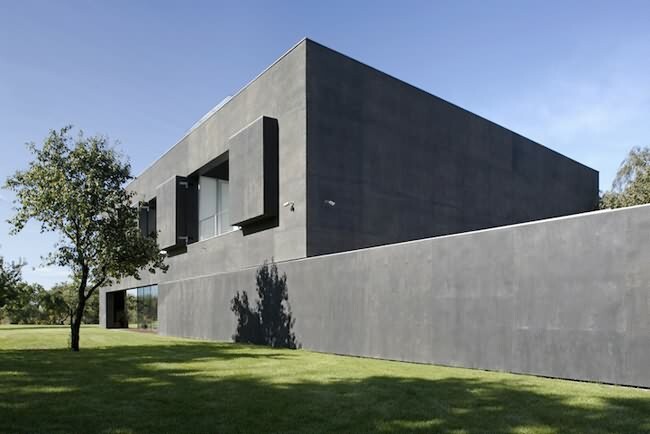 The house took the form of a cuboid in which parts of the exterior walls are movable. When the house opens up to the garden, eastern and western side walls move towards the exterior fence creating a courtyard. After crossing the gate one has to wait in this safety zone before being let inside the house. In the same time, there is no risk of children escaping to the street area in an uncontrolled way while playing in the garden. 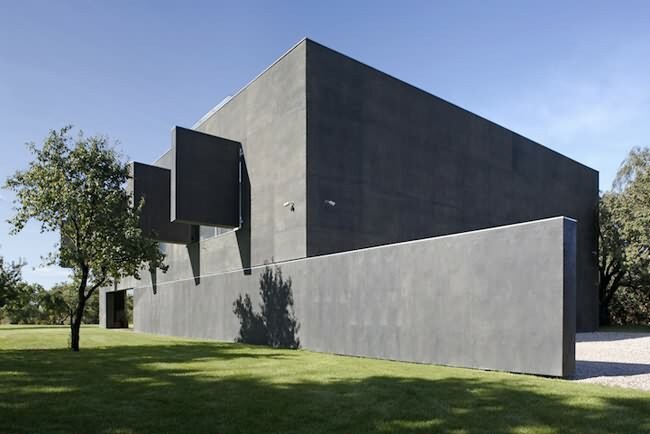 The sliding walls are not dependent on the form of the building. That is why this patent can be applied to both modern and traditional, single- and multi � storeyed houses covered with roofs of different geometry. This universal solution we came up with gives a new type of building where not the form but the way of functioning is the most important. The name: "safe house" gains a new meaning now. Accomplishment of this idea required the use of technically complex solutions. 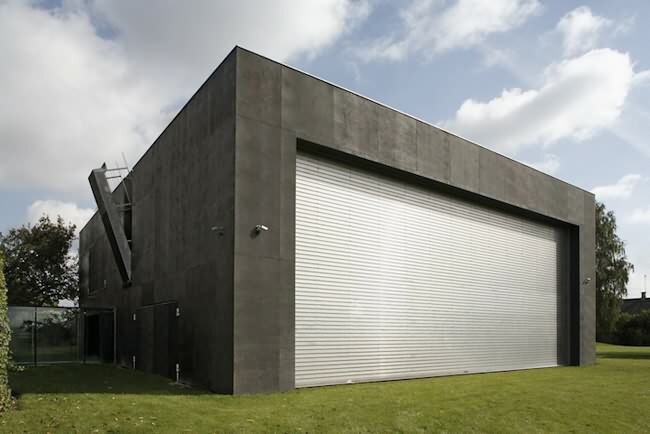 The most significant are the sliding walls (both 2,2 m high, 22 and 15 m long), which allow to interfere with the urban structure and determine the safe zone of the plot. They are not the only mobile elements of the building. Apart from these, there are large shutters (all 2,8 m high, with a width ranging up to 3,5 m, opening up to 180 degrees) and a drawbridge leading to the roof terrace above the swimming pool. The southern elevation is closed by an enormous roll-down gate of 14 and 6 m manufactured by a company normally supplying shipyards and air companies. 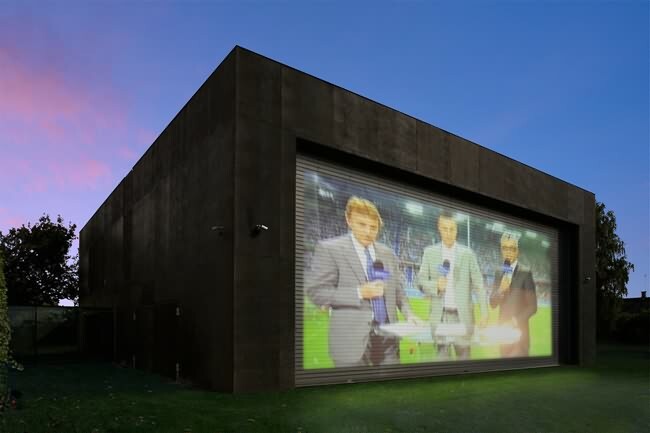 It is made with white anodized aluminum which makes it possible to function as a movie projection screen. All the movable elements are based on built-in electronic engines, that guarantee safe operation. 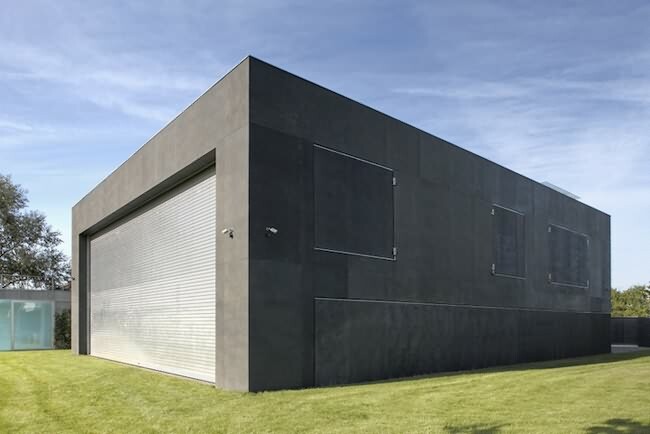 The whole building is a concrete monolith, while it's mobile parts � for the sake of considerable size � are light steel trusses filled with mineral wool. As a result, the building is perfectly insulated when closed. The whole house as well as the mobile elements are clad with cement-bonded particleboards � Cetris and waterproof alder plywood fixed to a steel construction and painted with dark wood stain, which resembles the wood widely found on the surrounding houses and barns, and makes it fit well into the rural landscape. 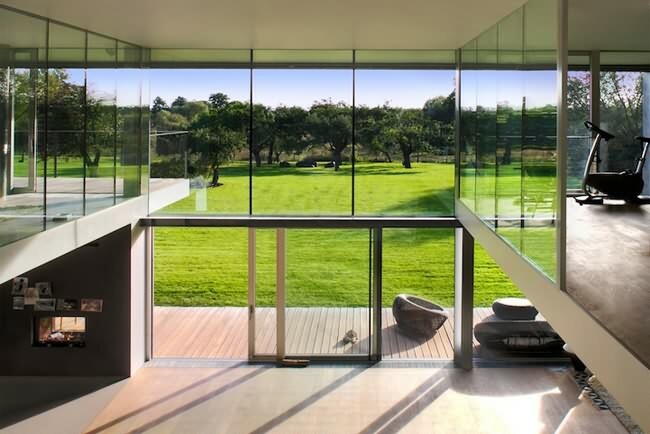 Once the house opens, it's bright and spacious interior merges extensively with the garden. 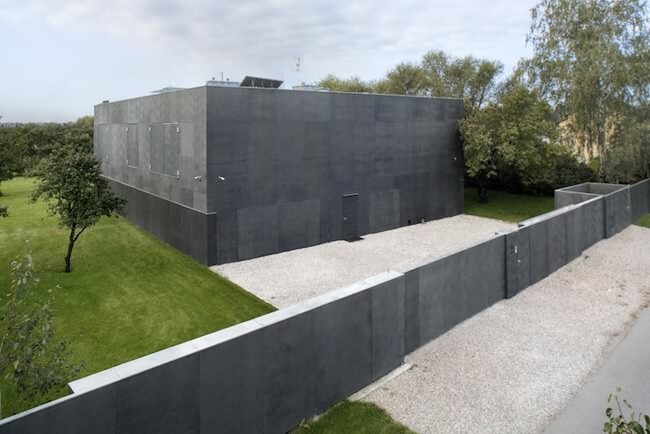 Wide glazings behind the movable walls let the building acquire energy during the day (winter) or prevent the sun's heat from going into the house (summer). At night, when the house is closed, the thick outer layer helps the building to accumulate the gained energy. 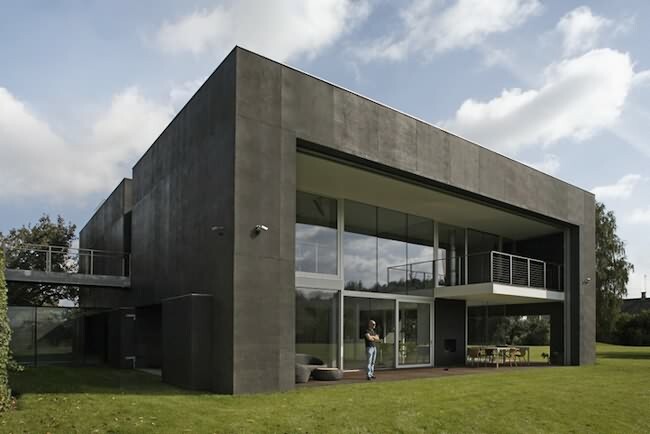 Such a solution together with the hybrid heat system (most of the energy is gained from renewable sources � heat pump and solar systems supported with gas heating) and mechanical ventilation with heat recovery makes the house become an intelligent passive building. Every day the house acts in a similar way � it wakes up every morning to close up after the dusk. This routine reminds of the processes occurring in nature � the house resembles a plant in its day and night cycle.